P1182. 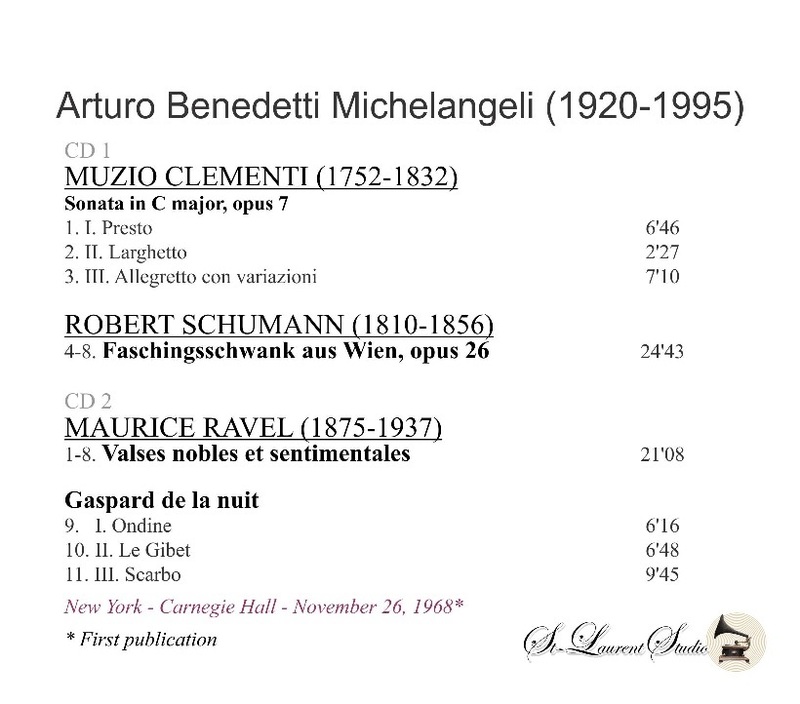 ARTURO BENEDETTI MICHELANGELI: Valses nobles et sentimentales; Gaspard de la nuit (both Ravel); Sonata in B-flat, Op.12, #1 (Clementi); Faschingsswank aus Wien (Schumann). (Canada) 2-St Laurent Studio YSL T-284, Live Performance, 26 Nov., 1968, Carnegie Hall - [stunning sound in the Carnegie Hall acoustic, recorded on an Uher recorder with Sennheiser mike from a choice location in the Hall, far from audience members. It has an absolutely glorious resonant acoustic, virtually unmarred by audience noise! Never previously issued.] Transfers by Yves St Laurent. 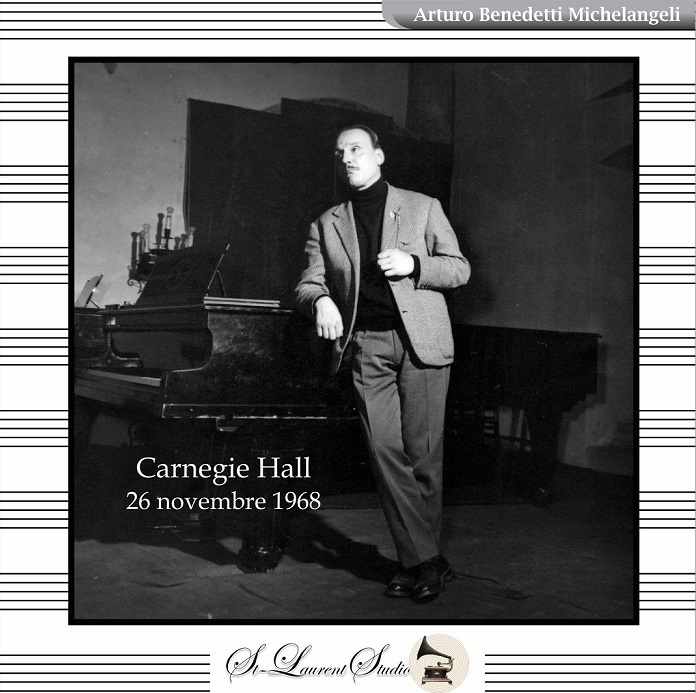 “Although there are many live-performance ‘pirate’ recordings of concerts given by Michelangeli, this is a major discovery: a first release of his dazzling 1968 Carnegie Hall recital. I have never seen this material elsewhere. Even more impressive is the excellent, if slightly distant, monaural sound. This is not the work of some amateur sitting in the balcony with an Uher under his coat. The big news here is the combination of Ravel’s ‘Valses nobles et sentimentales’ and ‘Gaspard de la nuit’ on one program, something Michelangeli rarely did. ‘Gaspard’ was, of course, one of his specialties, and there are recordings of many performances by him. But the ‘Valses’ are much rarer. In both cases, we have Michelangeli at his best here—a complete master of the keyboard, and a master of color in Ravel’s music. Ravel and Debussy were the two composers the mercurial pianist most loved and seemed most at home with. His range of dynamic shading is unique, his sense for chordal balancing and color in this music is without parallel. Michelangeli draws us a picture of the water in ‘Ondine’, creates a desolate atmosphere in ‘Le Gibet’, and technical polish in what we know to be a live, unedited, ‘Scarbo’ in ‘Gaspard’ which is jaw-droppingly awesome. About the Clementi and Schumann there will be less consensus. The crystalline clarity of his playing in the Schumann will not please those who would prefer a warmer, darker, more blended sound. This is a performance of extremes—great contrasts of tempo and of dynamics. Some of the playing will seem hectic to doubters. But others will find it exciting, daring, and filled with drama. I will admit to falling into the latter camp. The Clementi Sonata is quite fast, but played with utmost textural clarity and, in the second movement, a lovely singing line. Again, some might wish for a bit less speed in the finale, but I found it exciting. 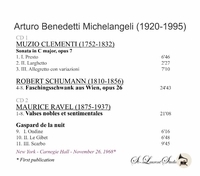 “Caught during a live performance in a white-hot recital in Carnegie Hall, Arturo Benedetti Michelangeli stuns us with both Ravel’s ‘Gaspard de la nuit’ and ‘Valses nobles et sentimentals’, this recording now seeing the light of day for the first time since their performance date, 26 Nov., 1968. This tremendous technician and great artist was known to cancel virtually as often as he actually performed!"